The Quilt Easy offers you the flexibility and freedom of hand quilting, with the precision and speed of a machine - finish quilting projects faster than ever before! 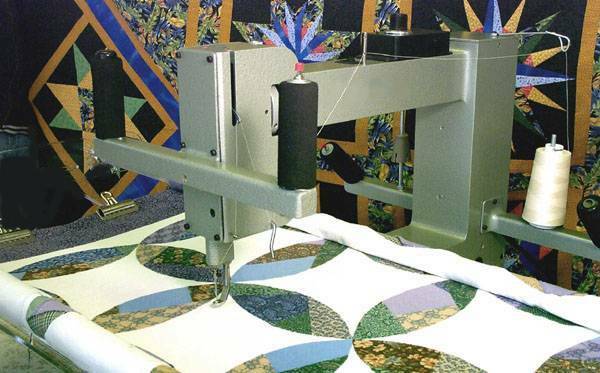 The gliding carriage allows you to guide and pivot your machine easily around the quilt, rather than wrestling a giant quilt inside your machine. Excellent for stippling, meandering, serpentining, thread painting, outlining, following pantographs, stitching in the ditch, etc., as the machine is able to rotate in all directions. 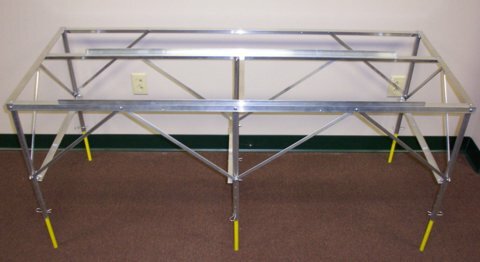 Sturdy aluminum frame and rigid poles allow you to make quilts from 30 inches to 125 inch king size quilts. 14 inch leaders allows you to access all areas of your project, while elastic straps hold your quilt taut from the sides. 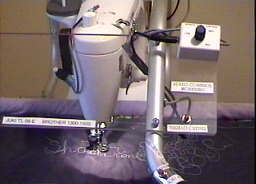 It has a feature whereby you can tighten your quilt from the ends, and not use the rods for tightening. The Quilt Easy is compact, portable and weighs less than 40 lbs. 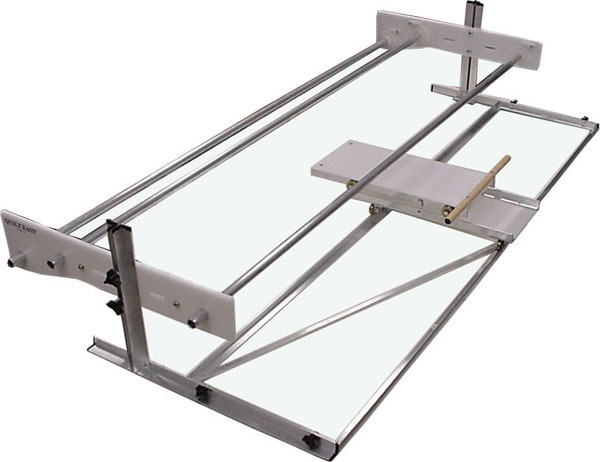 By simply unscrewing the nuts, the unit quickly collapses for easy storage. Assembly is simple. Just set the Quilt Easy on a table, or better yet, on our Floor Frame, and set your sewing machine on the gliding carriage. 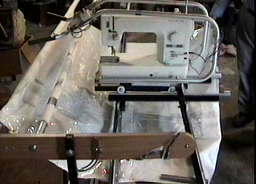 Stops on the lower carriage keep the sewing machine from rolling off. The Quilt Easy comes with instructions featuring EASY, (no tools required), assembly and operation. 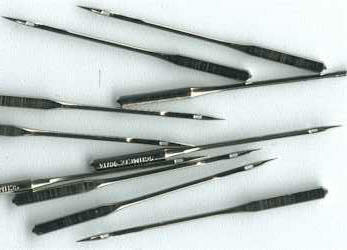 The frame can also be used for hand quilting. The uses for the Quilt Easy are only limited to your imagination! 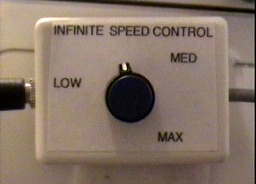 For other non-computer machines contact Gene for machine compatibility. Contact Gene with any questions you may have! 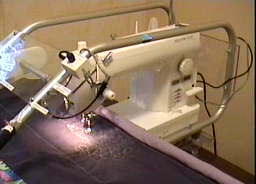 QUILT EASY QUEEN SIZE + FRONT RUNNERS + JUKI TL98E SEWING MACHINE + VARIABLE SPEED CONTROL + FOOT PEDAL ELIMINATOR = SUCCESS! King size - Add only $20.00. Interested in a Dealership??? Contact Gene. Large inventory not required. Quilt Easy and can be adapted to several other quilt frames on request. and comes in 2 colors - Luscious Lavender or Gorgeous Green. 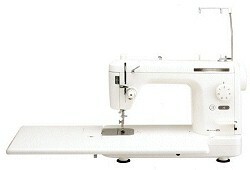 ORDER : SHIRLEY'S LONG ARM $3900.00 plus shipping (35 pounds) by zipcode. With Modification $4000.00 plus shipping (35 pounds) by zipcode. Another wonderful invention from Gene & Shirley! Easily clips onto your sewing machine bobbin case latch to remove and install your bobbins. 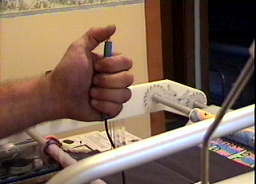 No more fumbling and breaking fingernails! 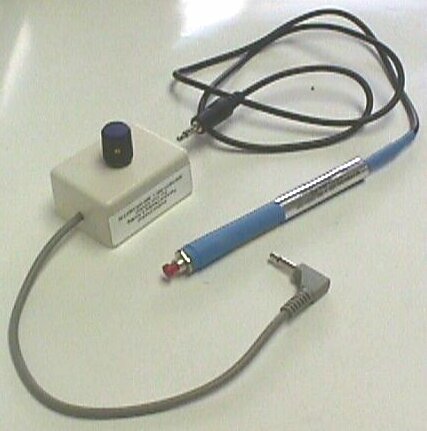 Size = 3/4" x 6"